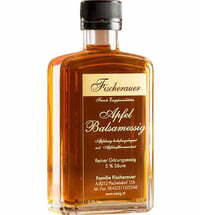 A fruity white wine balsamic vinegar, which was prepared with wild elderflowers. It enchants with its golden color and intense aroma of wild elderflowers. The aroma of the elderflower blossoms has a distinct sweetness that fits well with all kinds of salads, main dishes and desserts.